Is Ariel planning an all-electric Atom? Will the UK get an electric version of the insane Ariel Atom? We think it might. 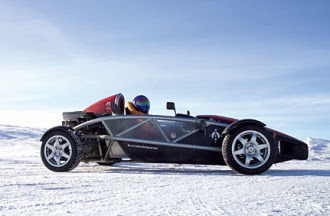 The Atom is of course the exoskeletal sportscar that’s ideal for summer Sunday blasts, track-day thrills and, er, travelling to the Arctic circle. Bonkers as the standard Atom is, there’s a slightly more unhinged version running around in the US: the Wrightspeed X1 is an Atom chassis fitted with a pure electric drivetrain that is good for 0-60mph in three seconds. This neck-threatening pace arises from a 300hp AC Propulsion electric motor powered by a bundle of lithium-ion batteries. Regenerative braking helps to muster a claimed 100-mile range, while a full recharge takes about five hours. Sadly the X1 is not an accurate taste of things to come Stateside. Wrightspeed is reportedly planning a more practical sportscar for sale to the public, based around a diesel-electric hybrid engine and boasting actual bodywork, but the X1 is apparently destined to remain a one-off. Now this is pure speculation on our part, but it surely cannot be coincidence that Somerset-based Ariel has applied for a trademark on the word “Elektron”. The name was revealed by the UK Intellectual Property Office in December 2007, in a list of proposed brands published so that other firms can be forewarned and, if necessary, lodge a protest if they have a similar trade name. What could be a better name for an all-electric Atom than Elektron? Mind you, all this quantum-level guesswork is subject to the uncertainty principle. It is just a theory, after all.